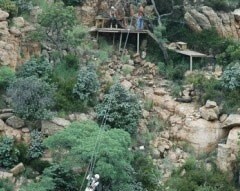 The Canopy Tour is a unique eco-adventure that takes clients on a tour down the spectacular Ysterhout Kloof, set in the ancient Magaliesberg Mountains. Eleven platforms have been built against the cliffs and rock faces of the kloof and are joined by long steel cables that clients slide along to reach the next platform. 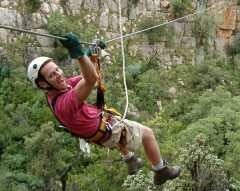 Much like a "foefie" slide, the canopy tour essentially involves zigzagging down the kloof while stopping at each platform to admire the expansive views and surrounding ecology. Two trained canopy guides assure the safety of each participant while describing interesting facts about the indigenous plants, bird life, ecology and geology of the area. Including the briefing session tours last approximately 2,5 hours.